My friend Patrick Nash, who has kept his talent for creating fine art like the proverbial lamp under the bushel for two decades, surfaced on the New York art scene in the last few weeks with a show at SL Gallery. Tonight he gave a Q&A about his work and career, painting a picture of the East Village as it used to be, full of abandoned and semi-abandoned buildings and people who saw in the devastated landscape an invitation to create. Eventually, however, Patrick left his squalid digs in the East Village and invested his talents in something more remunerative than pure art, starting Patrick Nash Design, which has done all kinds of amazing installations for big and small businesses and well-known artists. 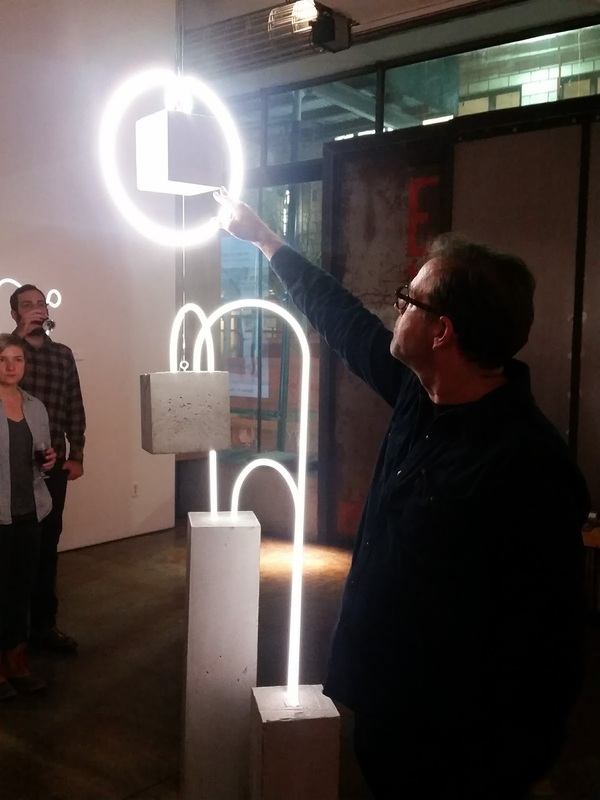 It was only when Bill Schwinghammer invited Patrick to install a show in his gallery that Patrick’s love of art for art’s sake (and neon for neon’s sake) was rekindled. Or maybe the love was always there but the bandwidth wasn’t. In any event, as he related during the Q&A, his 20 years of creating signs and installations for others combined with his always active imagination, led him to create one amazing piece after another, like the work in the photo above, a delicate argon-infused circle around a block of cement suspended like a thought bubble over our heads. To learn more, check out this interview with Patrick on whitehotmagazine.com.